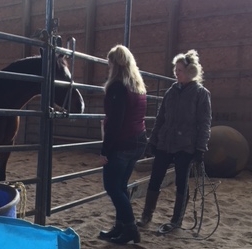 Horses provide instant objective, non-judgmental biofeedback on our leadership capability, intention, and motivation. Clients learn to have stronger and more effective presence, make better decisions, and lead with compassion and clarity. Your experience is customized to your specific goals, and your learning will last a lifetime. Contact us for more information about the pivotal, powerful experiential learning that occurs when we partner with horses! 2 hour, 1/2 day and full day workshops available for individuals and groups. The impact is immediate and lasting, exponentially more powerful than regular coaching.